Here is a deadlift instructional video that I shot while working out last week down at the Las Vegas Athletic Club. The deadlift is one of the oldest weight training exercises and it is also one of the most effective exercises for overall total body muscular development. There is a lot of confusion and misconceptions when it comes to the deadlift. Some people think that it is a dangerous exercise. However, when it is done properly, it is one of the most productive exercises that you can do in your workouts. To get more deadlift training tips check out my 7 week deadlift cycle, which is included as an extra bonus report with the Blast Your Bench program. So the difference between the dead lift and the stiff legged deadlift is the less bending of the knees? What about a partial dead lift? can you use smith machine for deadlift and show me what form .Some stand on blocks or stepper to do it what is best and safest yours kev. It is great. I do it and will stick to it. I wonder how much important the weight is. I usually start with 60 kg and doing pyramid method end up with 170-80 kg. Can I get the same result with the maximum weights of 120 kg? Nice video. But I have read in more than one magazine that most trainers are moving away from alternate grip. Clients tend to use the same grip and one side of their rear delts, traps over develop more than the other. Heh, most of those weren't D-E-A-Dlifts (being a smartass :D). Okay so, I have trouble keeping my back straight, even without weight when I bend my knees, stiff legged works OK with me, but I'd like to be able to do the traditional deadlift properly, back straight. I've done some research and found out that it may be about hip mobility, I've stretched and done different kind of hip mobility exercises but they haven't been much of a help. So could you give me some tips about keeping the back straight. Great blog BTW. Enter your name and primary e-mail address below, and I'll send you my "FREE 10-Part Bodybuilding Tips e-Course". I got started working out when I was 12 years old. In 1990 my dad gave me a home gym for Christmas, it was a York 2001 machine and a York barbell and dumbbell set. From that point on I was hooked on working out. During high school I worked out consistently and I would read every bodybuilding and fitness magazine that I could get my hands on. I’d get bodybuilding and exercise books from the library. I would record every bodybuilding contest that was on television and watch them over and over again. I was obsessed with learning as much about bodybuilding, exercise and nutrition as I could. While in my last year of high school I entered my first Bodybuilding contest, The 1995 Newfoundland Provincials, I was 17 years old at the time. Since then I have competed almost every year in bodybuilding competitions. Are You Overtraining In Your Workouts? How To Add 2 Inches Of Solid Muscle Mass To Your Arms In Just 8 Weeks! Find out EXACTLY how a scrawny little twerp outsmarted lousy genetics and cracked the code to packing on inches of sleeve stretching muscle to skinny noodle thin arms. 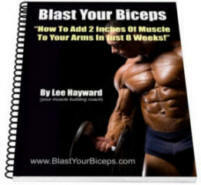 Check Out The "Blast Your Biceps" Program NOW! 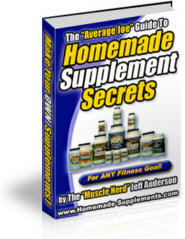 Learn STEP-BY-STEP recipes that ANYONE can follow to begin EASILY making your OWN muscle building supplement formulas right in your very own home for pennies on the dollar. A step-by-step Bodybuilding Competition Training Guide that explains everything you need to know about preparing for and looking your best at your first bodybuilding competition. You're Not A "Beginner" Anymore... So Stop TRAINING Like One! 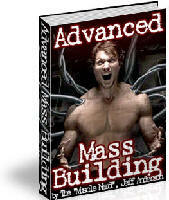 Why 95% Of Guys Are DEAD WRONG In How They Train To Gain Muscle Mass And How To INSTANTLY Correct The 5 Biggest Mass Building Mistakes For Thick New Growth NOW! How To Add 51 lbs. To Your Bench Press In Only 3 Weeks! Take your personal bench press record to new heights with the Blast Your Bench program. This step-by-step plan that will increase your max bench press by as much as 50 lbs. in just a few weeks. Check Out The Blast Your Bench Program Now! Discover My 'Paint-By-Numbers' Muscle Building System – And Learn Exactly How To Blast Through Plateaus And Pack On 25+ Pounds Of Muscular Bodyweight In The Next 90 Days! Get Your Copy Of The Bio-Genetic Muscle Weight Gain System TODAY! The Heavy Grips hand gripper series was developed for athletes who want to take the training of their grip strength to the next level. These heavy-duty hand grippers allow you to train your grip and actually gain strength using low repetitions instead of doing endless reps with plastic handled dept. store hand grippers. Special Discounts on orders of 2 or more grippers! "I Swear...I'm NOT On Steroids!" Discover The Simple 3-Step Training Program That Slapped On 20 LBS Of Rock Hard Muscle! Lee Hayward can help you get into your best shape ever with a personalized diet and training program, specifically designed for your individual body type and metabolism. Not only will you get a fully customized program, but you’ll also get unlimited one-on-one online coaching to ensure that you maximize your progress. Whether your goal is to lose bodyfat, gain muscular bodyweight, or just to look and feel better; Lee will help get the results you want. Click Here to find out how you can sign up for one-on-one online personal training from Lee Hayward.